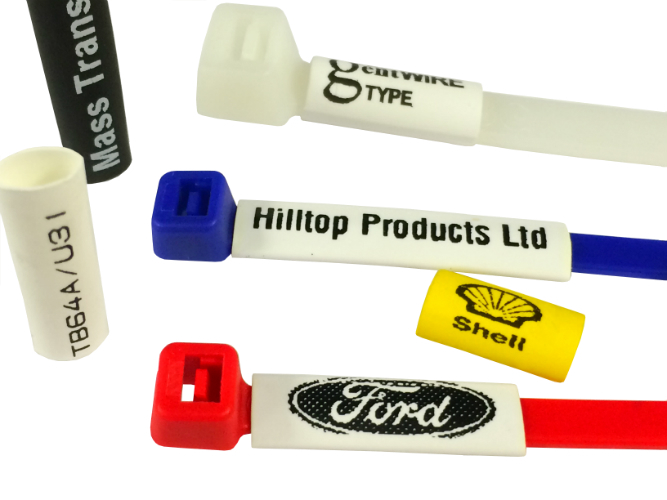 Examples of EASY PUSH FIT MARKERS pushed onto Cable Ties to give a Great Printed Cable Tie Finish!! Easy Push Fit - These Polyolefin or PVC Sleeves with special surface finish for printing, enables us to mark more quickly than when directly onto the cable tie, the direct advantage of this is that there are no additional tooling costs. With these 'Easy Push Fit Sleeves' we can provide a more complexed identification with Logo's, Branding, Web address and Bar Codes etc..
Low Batch / Low Order quantities gives it a High 5!! The most common cable tie kit requested is with a HTP-TR5- 200mm x 4.8mm cable tie, typically a full colour range avialable from stock. All other sizes of Cable ties are however also available for an Easy Push fit marker solution. 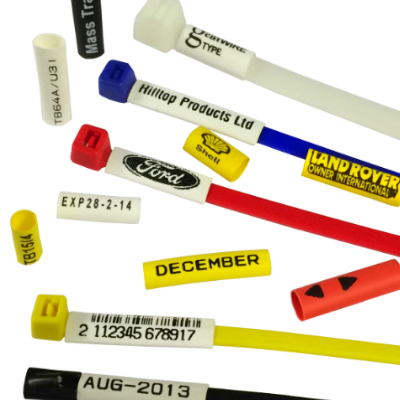 Easy Push Fit Markers are the perfect solution for identification for all Cable ties. Hilltop supply these in a simple kit format, this with the appropriate Cable ties and pre-printed Easy Push Fit sleeves, these are purposely designed for a simple and easy push fit onto the cable tie. Easy Push Fit Markers provide a far superior finish than any standard etched printed cable tie, the clarity and quality you get from the cable tie, partnered with the polyolefin heat shrinkable or PVC sleeve is likewise far better than any hot foil stamped printed cable tie. Whilst being heat shrinkable if required, it is not necessary to shrink them into position on the cable tie, indeed the majority of our existing customers merely push fit the marker into place, once the cable tie is lock and secured into position, then so is the Easy Push Fit Marker. 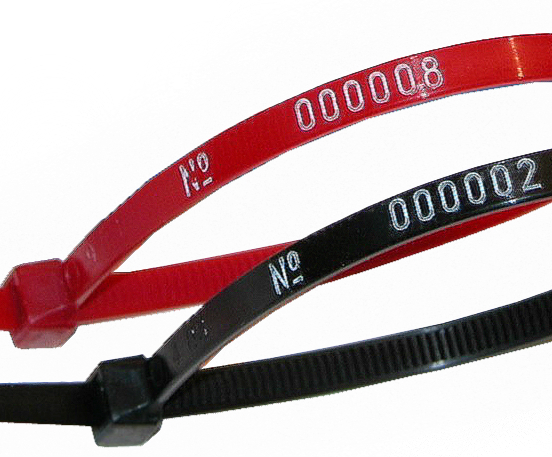 Our Cable Ties and Polyolefin Markers are of High Quality and Low Cost that gives you the best results every time. For further information please contact our sales team.